KoopaTV: BOMBSHELL! 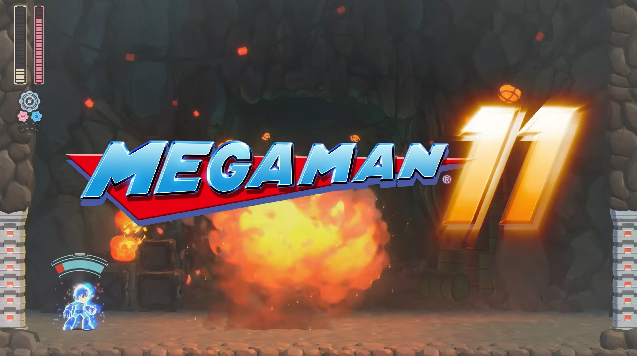 MEGA MAN 11 ANNOUNCED! You see that? Mega Man 11. Releasing “late 2018.” That's probably a year from now, for that all-so-sweet 31st anniversary. Absolute emptiness from 2013 to 2017, which coincides with the years KoopaTV has existed. You go from no Mega Man to the eleventh Mega Man. I asked for thoughts from my staff, and Rawk started ranting to me. I gave this big response about what an idiotic opinion this is, and in there I mentioned that Mega Man 11 isn't 8-bit. It turns out he didn't even watch the trailer or look at any screenshots. So, let's be clear: This isn't like Mega Man 9 or Mega Man 10 where you have an artistic decision to limit the graphics, sound, and gameplay complexity to an NES game. Mega Man 11 is the best-looking Mega Man game out there. It's out to be modern. After all, if Mega Man is going to be in the year 20XX, he shouldn't look like he's from 1987. And, unlike the embarrassing Mighty No. 9, the explosions of Mega Man 11 actually look like explosions instead of cheese. However, if you do want to see old Mega Man, then you'll be happy to hear that Mega Man Legacy Collection (Mega Man 1–6) and Mega Man Legacy Collection 2 (Meta Man 7–10) are coming to Nintendo Switch in the Spring of 2018! PLUS, all eight Mega Man X games are arriving to the Nintendo Switch, too, in the Summer of 2018! I think there is suddenly a very sweet reversal of sorts, and you can probably thank the incredible fan reaction to Mega Man in Super Smash Bros. For Wii U. Mega Man made it to the fan-favourite finals in the Super Smash Bros. Invitational at E3 2014 just off of fan votes alone (as opposed to actually winning any matches), especially because of his FINAL SMASH. Which it looks like he's using at the end of this Mega Man 11 trailer when it cuts to the title. That'd be appropriate, given the whole whole-series thing. That's right. Fans of other CAPCOM series (Street Fighter!) are now JEALOUS of how CAPCOM treats Mega Man. Who would've seen that coming a few years ago? Mega Man 11 was shown at E3 2018 and even gets a pre-order bonus. It keeps looking good, and it has new mechanics! What happens to Ludwig's opinion once he actually plays Mega Man 11, specifically, the demo? Mega Man 11 has released, and it's... good. I hope for another Woman Robot Master. Also I read a reply to a tweet which joked about the new revealed special weapon with the bricks as they connected it to President Trump. I hope for it too, but Dr. Wily probably doesn't want to get #MeToo'd. Oh, well, guess Time's Person of the Year won't get him. "We definitely feel like there are plenty of opportunities to add female Robot Masters in the future"
What the hell was the Mega Man team paid to do for the past 7 years, exactly? Reject concepts? Do you think this will be enjoyable to somebody who has never played a Megaman game? Also I'm afraid that it might have the curse and blessing of other games, that wish to emulate the glorious franchises of the past. It was a must-buy for every Banjo-Kazooie fan. And indeed it was a very good collect/jump'n'run game based on Banjo-Kazooie. The Problem was that Banjo-Kazooie, as well as Banjo-Tooie, just were too damn good. They were 100/100 games made at a time, where Rare was the non-plus-ultra video game studio worldwide. Naturally a mere Kickstarter project couldn't hope to emulate perfection. Same story with Hover: Revolt of Gamers, which tries to emulate the essence of possibly the greatest gaming franchise in existance: Jet Set Radio. Now Megaman is not some emulation, but the real franchise. But that might just stack the poker chips, so so say, as the potential to be another nail in the coffin of the franchise is more acute than with any "emulate-franchise" like Mighty No. 9 a.o. I have no idea if it'd be enjoyable to somebody who has never played a Mega Man game, because I can't judge from that trailer if it'd be enjoyable to anybody. I'm just assuming that it'll be better than Mighty No. 9. I was very early, back in 2013 on this very site, to tell people that Mighty No. 9 was preying on saps pleading for a Mega Man game. And the coverage and editorial against Inafune got more critical as time went on. I don't know if Mega Man 11 has anything to prove. It'd be good if it didn't have some unpassable standard to live up to. Those tend to drag projects down. I am not sure what took so long, but it is great to see the franchise be brought back to life. I never completed any of the games though I have played parts of some. The Legacy collections will be a must if I decide to get the new one. Mega Man 11 could very well be the series best. If I knew how CAPCOM's internal development teams were structured (what are the Mega Man developers doing when they're not making Mega Man?) I could better answer how CAPCOM chooses to allocate their people. I'd like to disclose my favourite game in the series is Mega Man 4. I prefer the music from Mega Man X to its remake, but I appreciate the backstory they gave to Vile. So you want more women Robot Masters, too?